The 24-Hour Mommy: Why choose a pedia dentist? Why choose a pedia dentist? I often pass by a pediatric dentist's clinic every time I wait for my son to finish his voice lessons in SM Megamall. Since the clinic is intended for kids, the place is designed to be kid-friendly with toys, books,and vibrant colors. Parents nowadays prefer to bring their children to pedia dental clinics like these. A reason for this may be because of the kiddie ambiance which helps kid to be at ease with their dentist. However, we should give these parents a pat on the shoulder for doing the right choice which is bringing their kids to a pediatric dentist. 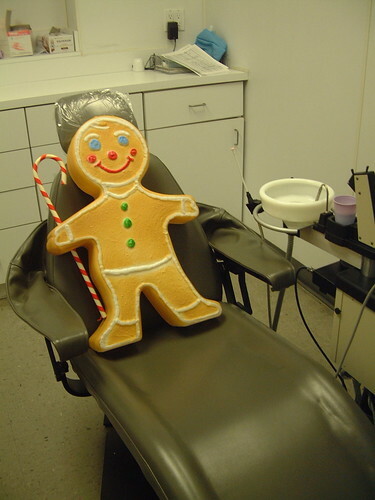 Image source: "At the Dentist" by Seth Werkheiser, c/o Flickr. Some Rights Reserved. Think of pediatric dentists as your kid's tooth doctor just like how your friendly pediatrician takes care of your kiddo's over-all health. It's a specialization really. After completing regular dental school, these dentists go on for an additional two or three years of specialty training. From further studies they learn more about a child's physical, psychological, and emotional growth. As such, they develop ways on how to treat children teeth without the trauma or fear of pain. Parents with young kids are actually luckier nowadays. My ten year old only got treated by a pedia dentist for the first time when he was already nine years old. You may need to pay more than what you give a general dental practitioner but it's all worth it. They have toys and what-have-yous that keep children distracted from the anxious feeling of seeing the dentist. It's as simple as this.. Adults have general dentists. Adults who need to make their teeth look better need to see a cosmetic dentist. (If you are in Charlotte in the US, you can find easily find a charlotte cosmetic dentist for your needs.) But kids need a pedia dentist.